Welcome back to the Blend. It's the worst-case medical scenario. You go in for surgery and something goes horribly wrong, so what can you do to help avoid botched plastic surgery? 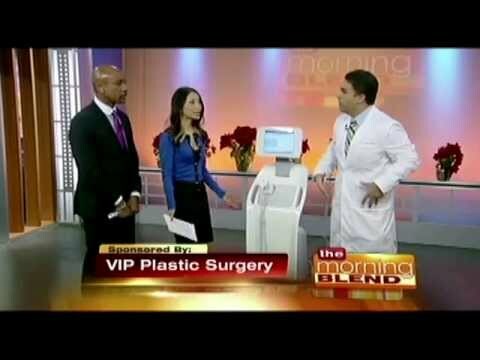 Here with tips is board-certified plastic surgeon, those are operative words, Dr. Christopher Khorsandi from VIP Plastic Surgery. We'll talk about that in just a second. How are you, Chris? Dr. Khorsandi: Good morning, Shawn. Thanks for having me here today. Shawn Tempesta: It's great having you. Plastic surgery, there's a show on E! right now called Botched. Dr. Khorsandi. : Right, very popular. Shawn Tempesta: Very popular, and I think people are kind of ... their ears kind of go up a little bit when they see some of these, or their eyes may be ... lids may be opened a little bit. Dr. Khorsandi: Right, so Botched is a sensationalized term. Basically, it's talking about surgery that doesn't go the way you expect it. The human body is dynamic, and there are a lot of reasons why things, sometimes, may not turn out the way you want, but in that show they focus on certain patients that have made some choices that led to things being wrong. Shawn Tempesta: Well, perhaps they went to a doctor that wasn't maybe fully qualified to be doing what they were doing. Shawn Tempesta: You can't stay awake and say, "No, cut here," you know. Dr. Khorsandi: Emergency medicine or family practice and still be doing plastic surgery. Shawn Tempesta: And that's legal? Dr. Khorsandi: As of the current situation, yes. Dr. Khorsandi: As long as you have a medical license, there's really no restriction on what you can do, and there's really no guidelines from the government in terms of what your specialty should include. You can have very limited training, a weekend course or even an evening course in certain things like fillers like Botox, and then you can go out and buy, legally, the fillers, Botox, even the instruments to do the surgery, and perform the surgery, and so there is some confusion with the consumer about where to go for your physician. We usually recommend to patients that the first step you do is to look at your surgeon and make sure that they're board certified and have the appropriate training in plastic surgery. That board that I'm part of is the American Board of Plastic Surgery, which is an important board because it really does vet out a lot of those who aren't qualified. The board certification process is quite lengthy, requires a full-day examination, written examination, and then a year of practice, and then a three-day exam, oral exam, in which you have to present your cases. Your cases are scrutinized by senior surgeons, usually 20-plus years in the field, and then you have to defend your surgical choices. You have to show your pre and postop pictures. Then there's another section on another day where they present you with all these kind of scenarios. What happens if this? What happens if that? That's not always the case in other boards, and that's not always the case for boards that don't specialize in plastic surgery. Dr. Khorsandi: The American Board of Plastic Surgery. Shawn Tempesta: So we should be looking for that. Dr. Khorsandi: Right. You can go on the American Board of Plastic Surgery's website and look for a plastic surgeon that's board certified in your area. Dr. Khorsandi: We have a number of great surgeons in Las Vegas who are all board certified that represent the board. Shawn Tempesta: If somebody's had a botched procedure, is there hope for them to get it fixed? Dr. Khorsandi: Absolutely. One of my best mentors in training said, "There's nothing that's done that can't be undone in plastic surgery." Although the recovery and the undoing process can take several steps, the body is plastic, and things can be restored to normal after problems occur. We see all these examples in the media of patients who've had horrific outcomes, and it does take time. The thing is is that you don't have to travel very far to find a surgeon who can do that here in Las Vegas. Part of my practice is revision surgery, revision rhinoplasty, revision breast surgery, for patients who may have gone out of the country for surgery looking for a quick, cheap sort of alternative and not gotten what they bargained for. The other issue is is that, just because a provider is the lowest-cost provider, doesn't necessarily mean that you're going to get the best quality work. Shawn Tempesta: Discount brain surgeons is not, yeah, a place I'm going to be going. Dr. Khorsandi: Right, and so it's the same idea, and you wouldn't take chances with your nose or your face or your body in the same way, so patients should really be aware of those sorts of things. Shawn Tempesta: I know you have a new office here in Vegas. You have an office in Los Angeles. Shawn Tempesta: What are the service that you offer? Dr. Khorsandi: We offer head-to-toe plastic surgery, reconstructive surgery, and cosmetic surgery. The focus in our practice is, again, rhinoplasty, breast surgery, facial procedures, but we do everything, and we do do a lot of revision rhinoplasty in our practice because it's something that I was specifically trained for in the last part of my training. I spent about six months with a physician in LA who had a practice of 35 years who really did a lot of the revision work in Los Angeles, so this was something that I was tuned to and something that I have a keen interest for. Shawn Tempesta: Now we're taking a look at pictures of your new office right now. Shawn Tempesta: You offer free consultations for people that might have questions. Dr. Khorsandi: Right, exactly. Oftentimes, there's this fear, "If I go in, what's the cost?" Well, it doesn't cost anything to come in and see us and see if there is something that we can do that can help you. A lot of times, patients who've had bad outcomes live in fear, and they live in this sort of unhappy state of mind because they've already had one bad experience. They don't want to have a second. Dr. Khorsandi: We offer a welcoming environment. It's nonjudgmental. We don't point a finger like, "Why did you do this?" which I think is a bad thing. The patients are already suffering from this doubt of, "I don't feel good about myself." Shawn Tempesta: Doctor, it's a pleasure. Dr. Khorsandi: Shawn, thank you, appreciate it. Shawn Tempesta: Thank you so much. Make sure you look for a board-certified plastic surgeon. VIP Plastic Surgery, they're located on Sunridge Heights in Parkway in Henderson. Dr. Khorsandi offers free consultations. If you'd like to learn more, go to vipplasticsurgery.com.